You’re standing on the shore near the docks, watching an artist paint the passenger boat which used to go down to Hong Kong but which now serves as hotel and nightclub. In the nineteenth-century, Westerners called this harbor Amoy. 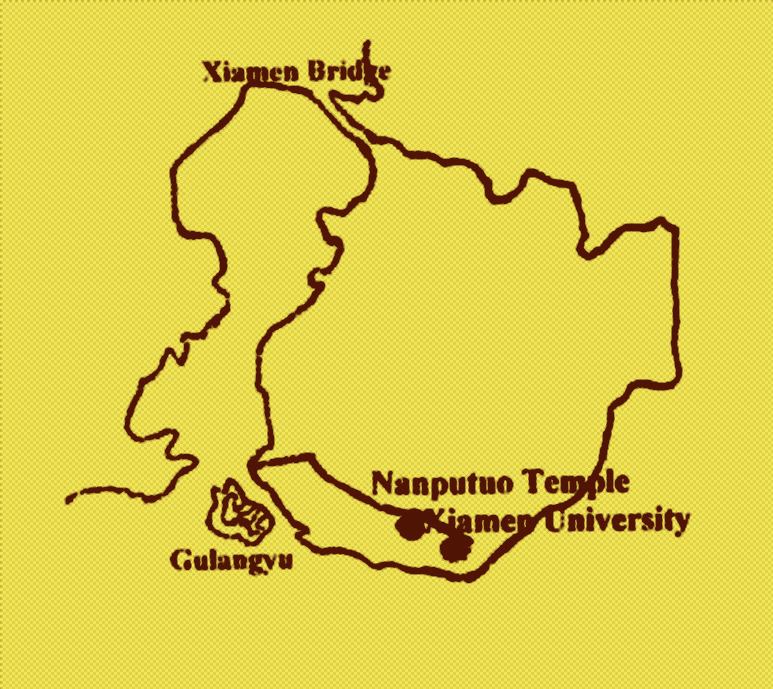 It’s now called Xiamen [pronounced approximately shamen], meaning the “lower gate” to China. 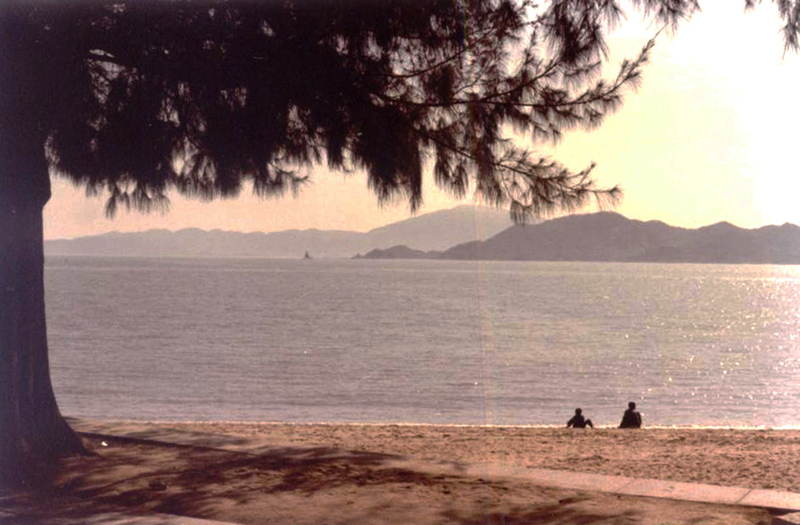 The two islands of Xiamen lie in Fujian Province across the strait from Taiwan. It was from here in 1661 that the seventeenth-century pirate-turned-patriot, the Ming loyalist Zheng Chenggong, trained his 990 ships and 25,000 marines and then drove the Dutch out of Taiwan. Later the area was occupied by Japanese pirates. During the Opium Wars, the harbor was taken by the British. 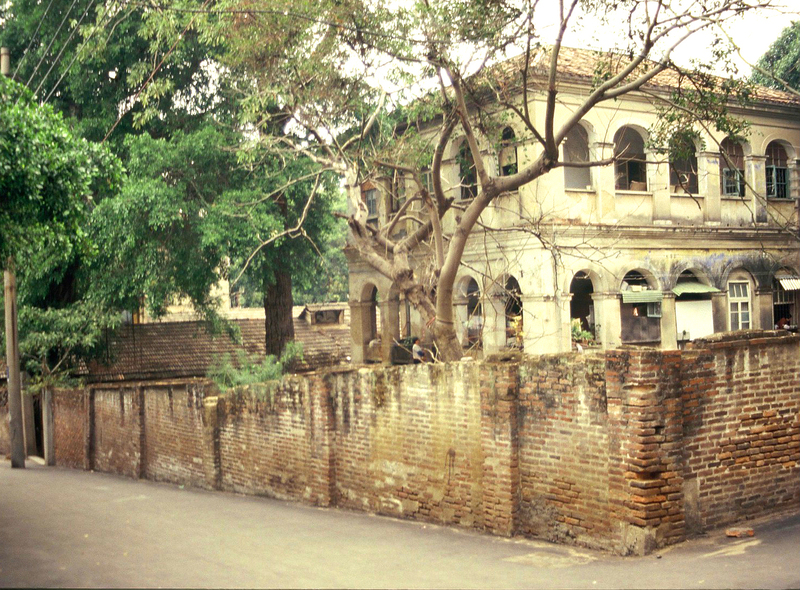 The smaller island of Gulangyu became a foreign settlement with consulates from Britain, the United States, Germany, Italy and Japan. Long after the People’s Republic of China and the Republic of China established separate governments, Xiamen had to duck gunfire between the two. In the early 1980s the first boat sailed from Shanghai through the Xiamen harbor down to Hong Kong, with everyone on board hoping Taiwan would not start shooting. 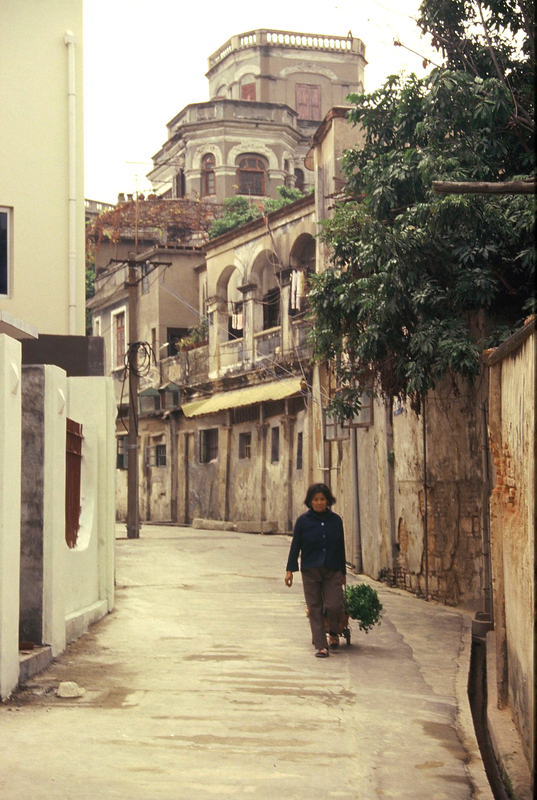 Nowadays Gulangyu is still closed to all vehicles except hand-drawn carts. From the harbor, you walk up a pedestrian lane past row houses and first-floor shops and then climb the hill to walled Mediterranean-style villas. Many seem abandoned, so you’re surprised to catch sight of freshly-washed laundry or hear someone practicing the piano. There’s a profusion of evergreen, gingko, eucalyptus and flowering trees. On the ferry going to Xiamen proper, you spot a fishing junk sailing in. From the harbor you walk along the covered sidewalks lining Zhongsan Lu, a main street. You notice the fresh paint on the facades and the new railing which prevents people from piling their bicycles between the sidewalk and the road. Inside the shops, you see that the old wooden cabinets have been replaced with glass ones. Some shops even have air-conditioning and new signs in fractured English. There are more Western products or luxury items like Band-Aids and ground coffee. 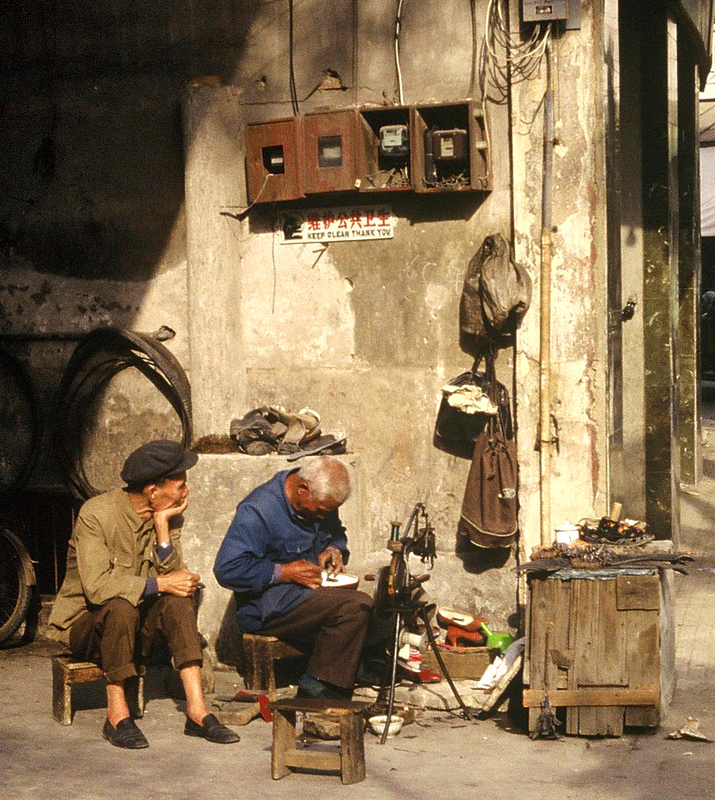 But small businesses, like repairing shoes and selling sewing notions, still operate out of wooden boxes on the sidewalks. You know riding a bike here is not easy, since they may be packed in four and five abreast, often with handlebars overlapping, which can throw a biker off balance. Also, if someone in front hawks loudly, the cyclists duck to avoid the flying spit. Very near the bicycles are the dilapidated buses for common people and modern minibuses or taxicabs for the rich. There are no private cars, but work units often have a car or van and a driver. The horns on all motorized traffic are loud, shrill and practically constant. As you cross a street, youave to run to avoid a bus careening around the corner. 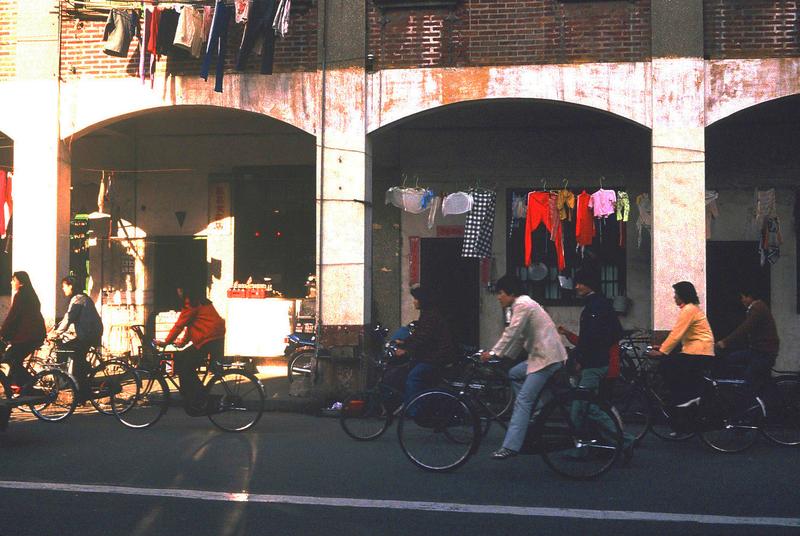 As you turn into Siming Lu and walk toward the university, the sidewalks become an extension of people’s living quarters, which are small and dark. Women squat doing their laundry in basins near the coin-operated cold water taps and hang the clothes on bamboo poles above the sidewalks. Old men sit playing cards or teaching their grandchildren to write the characters, other people repair furniture or knit sweaters with intricate patterns. The sidewalks give way to a road with narrow shoulders. The buildings space out a bit to make room for a garden with a few chickens, a walled factory or business compound, a bit of space, but there is no grass planted, only dust which is regularly raked clean of leaves. In December poinsettia plants near the road tower six, ten, fourteen feet high, above garden walls and well-tended rows of vegetables.Near the university lies Nanputuo, the largest Buddhist monastery in south China. Inside the temple walls there is a fish pond “for liberating living creatures” a second gate and the monastery buildings, which are built into the hillside. It is a peaceful place, now being spruced up with Overseas Chinese money. During the Cultural Revolution it suffered little because the townspeople and farmers stood in front of the gate to protect their temple from the Red Guards. 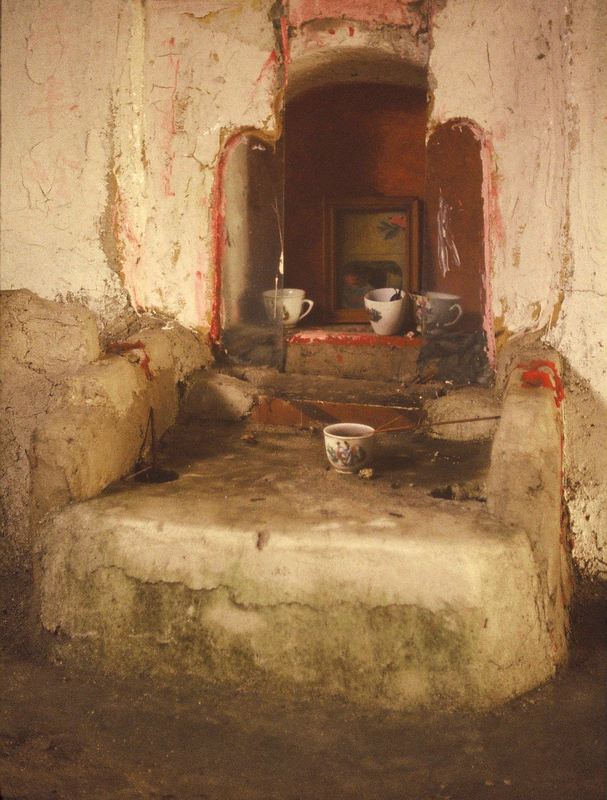 Among the rocks above the temple–and also outside of town–you see a red cloth door, brush it aside and enter a tiny shrine dedicated to household gods. 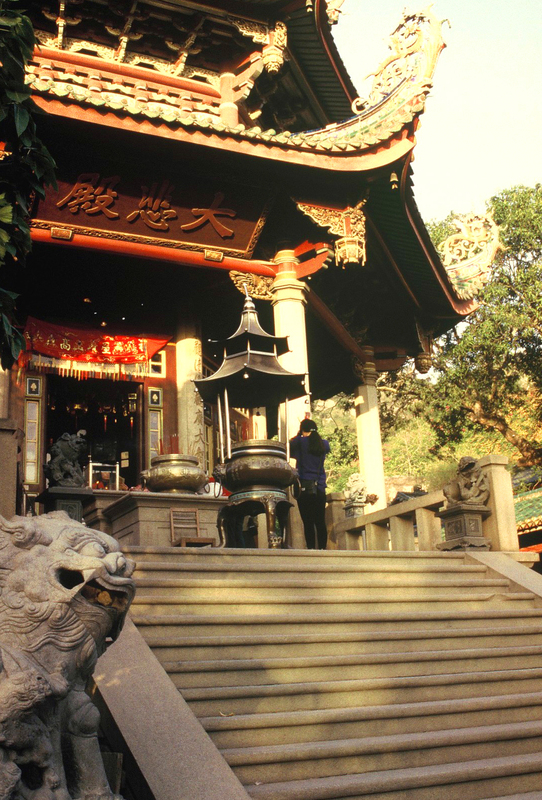 During the Cultural Revolution these shrines were forbidden, but now people are relatively open about visiting them. The university gate is two pillars connected with an arch-shaped sign and a metal door which can be locked in times of unrest. Guards sit in a guardhouse watching people coming in and occasionally checking identification cards. 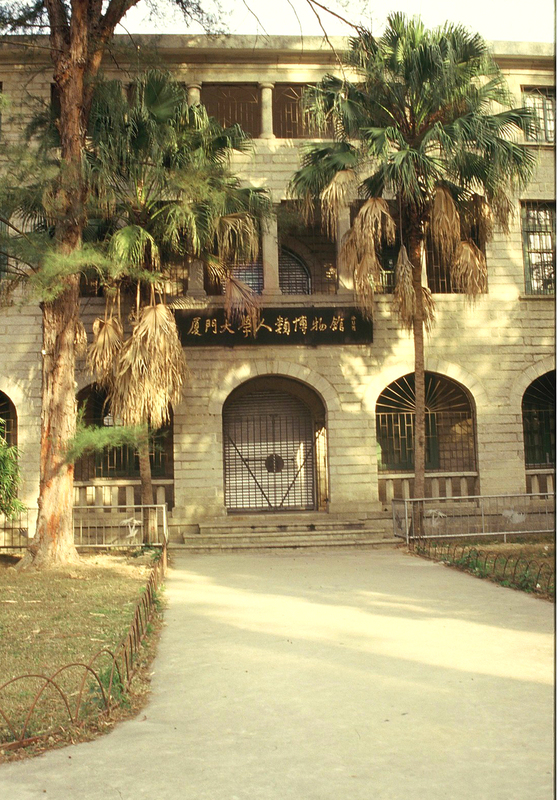 The post-revolutionary classroom buildings are made of grayish concrete slabs, but the older ones are elegant structures of hand-cut granite blocks and red roofs.There is a little stream, an artificial pond, flowering hibiscus and rhododendron, roses in January, orchids, palms, eucalyptus and bamboo. 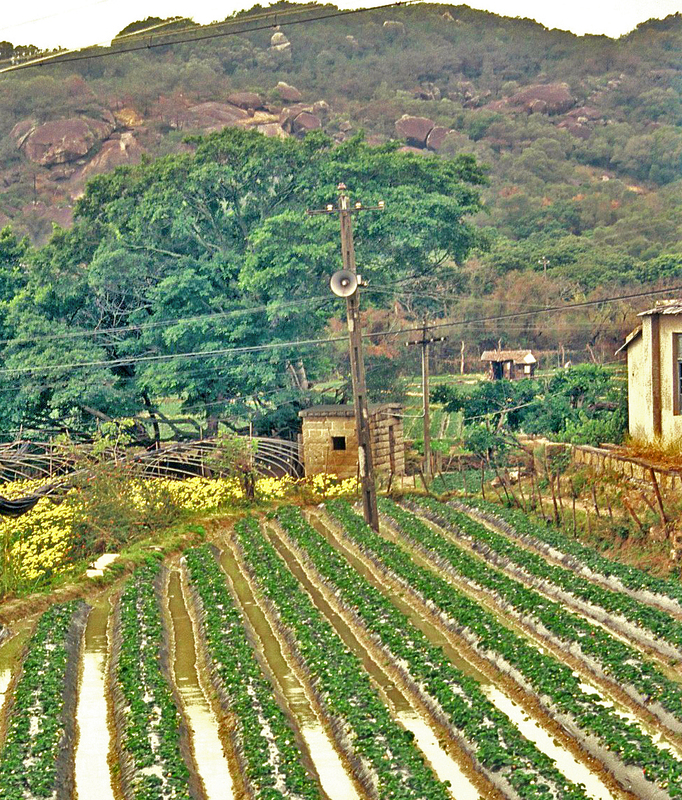 Stretches of flat, otherwise unoccupied land are not covered with well-manicured, bourgeois grass, but with obedient rows of post-revolutionary cabbages. Attached to some telephone poles and some buildings there are loud speakers which at various times of the day count out exercise routines—yi! er! san! si! wu! liu! qi! ba!—or blare out music, announcements or an English language program. The speakers are not quite in sync, so there is an echo effect. At an outdoor court, students shoot baskets. 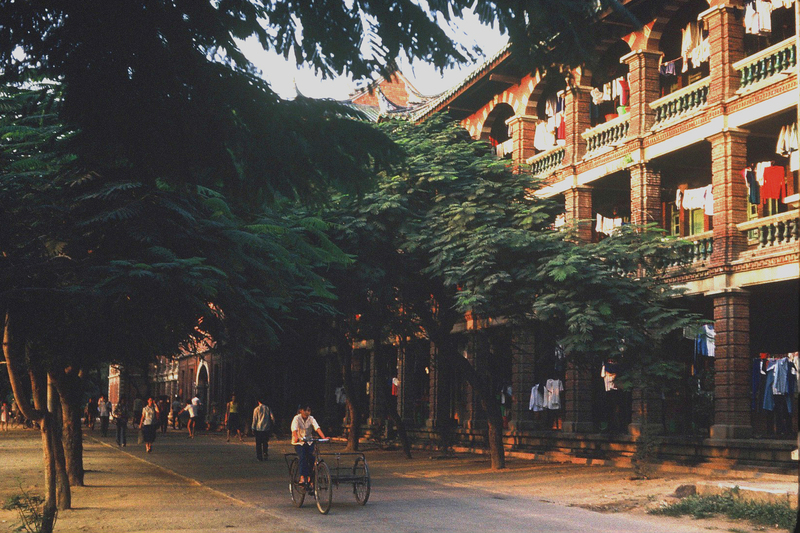 The three-story dormitories are of red brick, with balconies running the length of the building. At those times of the day when the water has been turned on, the area is full of students fetching water in buckets and hanging out laundry on bamboo poles. The male students stand in their bathing suits, washing themselves and pouring basins of water over their heads. You’ve heard the female students have to shower in the dark, rather smelly shower rooms inside. 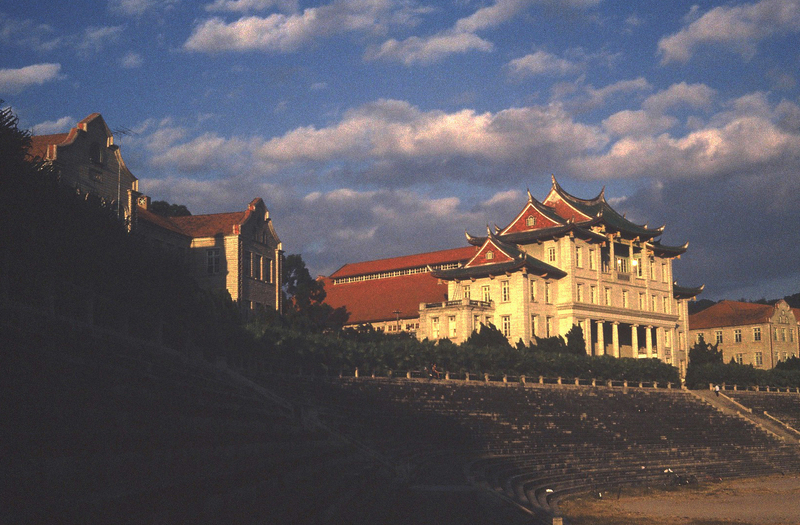 At the top of a ridge near the sea is a semicircle of traditional Chinese buildings dating from 1923, when the university was established with money from an Overseas Chinese benefactor who had grown rich on his rubber plantations in Singapore. The buildings overlook one edge of a soccer field, the same field where Zhen Chenggong trained his troops in hand-to-hand combat. Out the back gate, on the other side of the road, is a beautiful sandy beach lined pines. The outlying islands of Taiwan appear in the distance. Often they are quite audible as well, since Taiwan has continued its broadcast of propaganda directed at the People’s Republic, mostly in the form of late-night rock music. About a ten-minute stroll up the beach are the remains of a centuries-old fort, now being reconstructed, with the remains of an ancient cannon pointed at Taiwan. On the road beyond the fort, there is a sign in Chinese and English saying, “No foreigners beyond this point.” You glance around and then walk past it where you see an army camp, fields of rice and cabbages with blaring loudspeakers to keep them in line. A man in uniform addresses you as “comrade” and directs you back down the road. Twenty-two years later, you’ve returned for the second time to see how Xiamen, like other coastal cities, has grown and prospered. 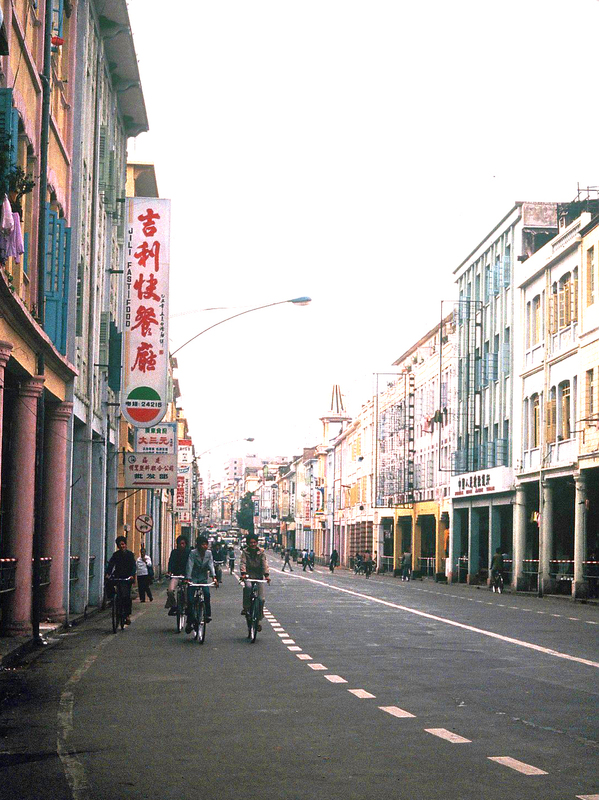 Despite the glitzy new storefronts and foreign brands, much of the old town has been preserved. Or at least it hasn’t been totally transformed. You know that the gap between rich and poor and between the urban areas and the countryside has grown so wide that it threatens stability. You’re horrified to see someone eating out of a garbage can and to learn that college tuition is no longer free. But you know in a country with such a long history much has changed, but much more has remained the same. There are so many details to flavour this facinating article: people protecting ‘their temple’, ‘dark, rather smelly showers,’ bicycling hazards, sounds of life in old villas. I like that you told the story in the second-person format; it’s an unusual way of looking at the tour. It makes me feel like, in another life, I might have been “you.” (What sold me on the You point of view was running to avoid the bus careening around the corner; I got a little spurt of adrenaline!) Your well-placed photos certainly add to the narrative; for example, I had no idea Taiwanese islands were so close to the mainland. The Taiwanese islands are not the first ones in the photo, they’re further back. For years Taiwan used loudspeakers to blast the mainland with propaganda. By 1984 instead of using words they used rock music. The message was in the volume. I couldn’t hear it from the university guesthouse near the temple, but people who lived near the beach heard it at night when the wind was blowing in the right direction. People I knew also spotted smugglers on Taiwanese fishing boats. But that’s another story. 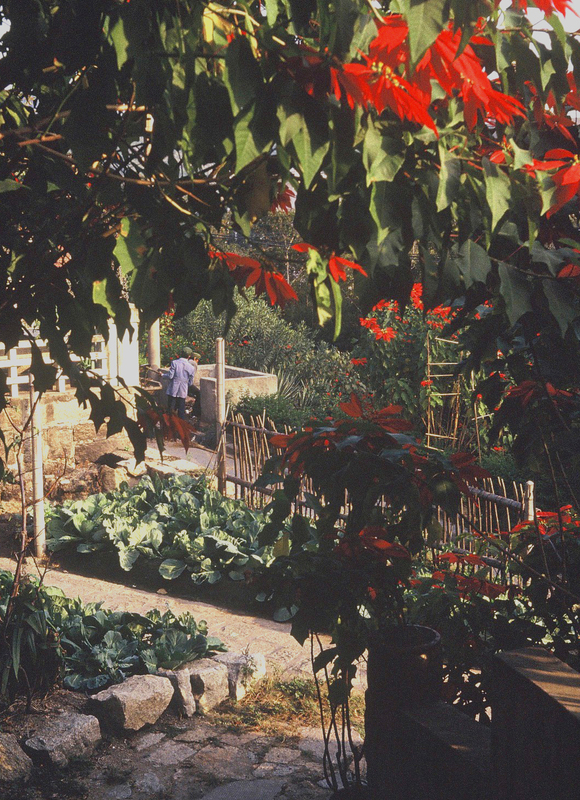 Beautiful photos, especially shoe repair and walled villa. Very painterly. Thanks. I love the post-revolutionary cabbages and the loudspeaker for vegetables. Both could be titles for rock albums. Thank you for this glimpse into a very interesting corner of the world. This is beautifully written and illustrated. I never had a whole lot of desire to go to Asia – I fear long plane rides – but this has changed my mind.